If you're looking for the highest quality, most durable stainless steel deck plate, you've come to the right place! Our deck plate comes in 18 gauge stainless steel. Options below are for full sheets of deck plate. 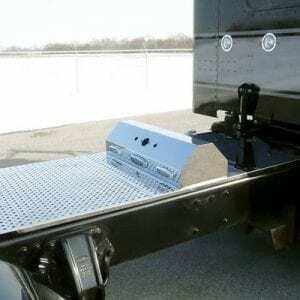 All deck plates are 33.25" wide and will fit any standard frame truck of any make/model. Options for length include: 12", 18", 24", 30", 36", 42", and 48". 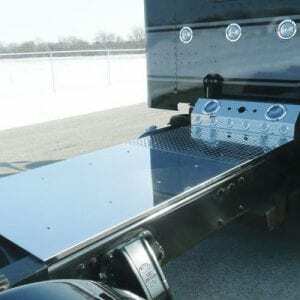 Stainless deck plate comes in both treaded and smooth variations. If you'd like a cutout for your airline box (single or double sided), contact us directly OR leave it in your order notes. If you'd like severe duty (14 gauge stainless) deck plate, contact us directly. If you have any questions or would like to order severe duty deck plate, deck plate with a cut out in it, or half smooth half treaded deck plate, email us at: [email protected], call us at: (765) 427-9268, OR send us a message directly on one of our social media accounts. Facebook, Instagram, Twitter.